Everyone knows you can use simple math equations to calculate whether you'll make or lose money on your blog. But doing this in reality is more intimidating that it seems! I finally decided it was time to create a budget that I could use and also share with others. This budget took a lot of thoughtful consideration to create....because bloggers at different stages and different types of blogs have different needs. For instance, what a beginner blogger needs is different from what a professional blogger needs. And what a food blogger needs is different than what a lifestyle blogger needs. 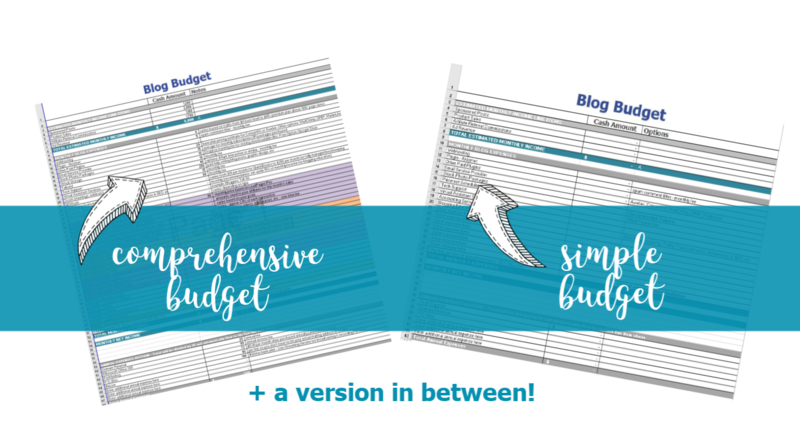 I spent a LOT of time in Excel thinking and tweaking this blog budget, and I believe I finally designed a spreadsheet that considers various stages & styles of blogging! What resulted was an Excel spreadsheet with multiple tabs - including instructions + a resources page - and three versions of the base budget depending on what level of detail you need. I've also included a tab called Blog Startup Budget for those who are trying to budget for the very beginning of their blogging journey. Wherever I could, I put explanations beside each expense line item so you could get an idea of the base cost for each type of expense. This is to help make your decision process easier and also for you to understand why each line item was included. Any lines you don't need, you can either zero out or delete the line altogether (I show you how in the video). The training video explains how to use the spreadsheet (down to the process of checking formulas to make sure you didn't screw anything up and which version of the budget you should use). The last tab of the spreadsheet is a list of recommended resources for bloggers. It's a great starting point if you're researching solutions, such as which email service provider to use or course creation platform is best. These recommendations are based on the services that I personally use to run my blogs WhatMommyDoes and Adventures in Blogging + recommendations from blogging friends I trust. Get Ready to Control Your Blog Finances Like a Pro! With the right tracking system you can predict and plan for the typical blogging expenses you'll need for every stage of your blogging journey. This easy-to-use Excel spreadsheet will help you keep track of all the important information you need. Track and plan your expenses like a CPA! How would you feel if you could easily see if you could afford that piece of equipment you've been wanting? OR if you'll need to up your income to offset some annual payments that are coming up? This spreadsheet is for bloggers who want to feel ON TOP of their blog expenses and prepare for the future growth. I hope you like it, and please let me know if you have any questions! Due to their downloadable and easily stolen nature. We do not offer refunds for digital products. I have been blogging on WhatMommyDoes for nearly 6 years and writing online since 2008. I also LOVE teaching. I was also an online course instructor for the University of Phoenix for 7 years (teaching business writing & accounting) and only left because I had to as my family AND blog grew! Adventures in Blogging is my return to teaching, while still maintaining my own blog and using it as an example in many of my lessons. In addition to teaching, I worked in a corporate job as a CPA before quitting to become a stay-at-home-mom in 2007, and after a while at home, I wanted something to call my own. I built up my blog piece by piece over the years, slowly adding content as I had time during nap times and preschool hours and at night, and now I am a full time blogger. I really can't believe the amazing opportunities we have as bloggers. I am so excited you decided to join me on my blogging adventures!